Well, I had the opportunity to catch the launching of Hennessy VSOP's latest bottle design back a couple of weeks and it was pretty cool, complete with a party and all (Hennessy VSOP New Bottle Launch 2012) This writeup, will not be re-hashing the events from that day, but geared more towards explaining why Hennessy chose Chris Bangle for the design job, and more explanation on what changed on the new Hennessy VSOP bottle. ﻿﻿The following few paragraphs would be an excerpt from a detailed writeup provided by Hennessy to clear any questions or doubts about their latest new bottle. The answers will detail a bit more on Chris Bangle, then on the strengthened anti-counterfeit security measures on the bottle. What road map was Chris Bangle given for this job?Maison Hennessy asked Chris Bangle to upgrade the bottle rather than create a new one. It was important for Maison Hennessy to move forward in a spirit of continuity, seeking inspiration in the history of V.S.O.P. (highlighting the arm and axe, for example) as well as in the future that we want to shape for it (for example, by adding a hollow bottom for easier handling by bartenders who have to have fast, safe gestures). It was also important to ensure that the major features of V.S.O.P. (harmony and balance) are embodied in the bottle’s curves. Why spend so much time on anti-counterfeiting efforts?In order to ensure that there are no imitations or counterfeits, Maison Hennessy seeks to protect our products, which are made in Cognac in a respect for our traditions and our know-how. The Hennessy brand in itself is a guarantee of extreme quality, and could never be associated with products it does not make. Above and beyond the quality of the cognac served, there is the question of food safety. All our products are carefully inspected out of respect for the trust that our consumers place in us. 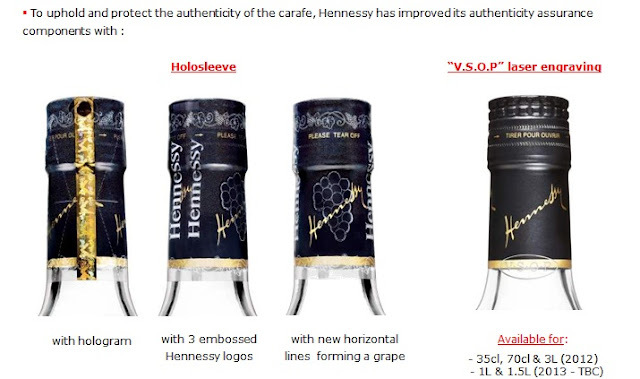 Check that you're getting the original Hennessy VSOP! Even though the bottle design may be new, but the contents has been kept unchanged, thanks to the constant work by the Cellar Master and his Tasting Committee. This was pointed out back in 1986 by Maurice Fillioux, a former cellar master at the House, who explained, “Every eau de vie that we use to produce our V.S.O.P. has a distinct personality. These personalities enrich each other. It is up to us to blend them to achieve the best result. We reproduce this result year after year, working with the vineyards and the years. Only the greatest brands are able to ensure such consistent quality”. Do remember to like Hennessy Malaysia's Facebook page over at www.fb.com/HennessyMalaysia for further information and more! Anybody wants to buy the old bottles - will become antique, no longer available.